Former Los Angeles Mayor Jim Hahn joins CES at a news conference to oppose San Fernando Valley and Hollywood secession alerting voters to the extreme danger secession presents to rent control, tenants' rights and affordable housing if secession was approved. 1) CES tenant leader Reyna Gonzales being recognized by Los Angeles City Attorney Rocky Delgadillo for her involvement and courage in bringing her building up to code. 2) CES tenant leader being interviewed during a healthy homes event. 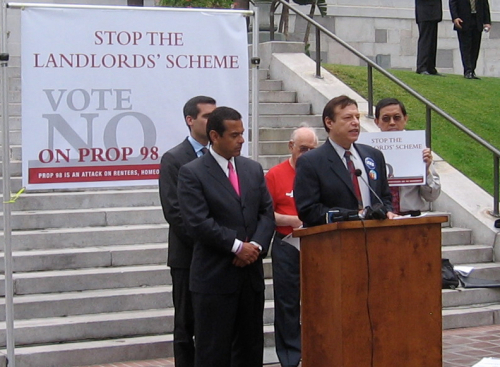 CES Executive Director Larry Gross joins with L.A. Mayor Antonio Villaraigosa, L.A. City Council President Eric Garcetti and representatives from AARP and the League of California Cities on the steps of L.A. City Hall to denounce Proposition 98, a statewide measure on the June 2008 ballot that would have wiped out rent control and tenants' rights in California. Low-Cost Housing: Another Crisis Looming? Will Condo Threat Unite Seniors? Is Rent Control a Lifeline? Tenants' Rights Under New Attack in L.A. Rent Abuses Surge. Landlords have hiked prices 50% since 1995.